Posted on 1, April 2019 by EuropaWire PR Editors | This entry was posted in Germany, Industrial, Marketing, News, Sweden, Switzerland, Technology and tagged ABB, Angela Merkel, Anja Karliczek, automation, Bernd Althusmann, digitalization, electrification, Factory of the Future, German Chancellor, Hannover Messe, Hans-Georg Krabbe, Jacob Wallenberg, PM of Sweden, robotics, robots, smart digital technologies, Stefan Löfven, Stefan Weil, Sweden, Ulrich Spiesshofer, YuMi. Bookmark the permalink. HANOVER, 1-Apr-2019 — /EuropaWire/ — ABB CEO Ulrich Spiesshofer explained how robots and humans will work together in a production cell in the factory of the future. Federal Chancellor Merkel and Swedish Prime Minister Löfven were shown how YuMi® robots put together wristwatches individually with unparalleled precision. The iconic, two-armed YuMi® and single-armed YuMi® robots use the revolutionary versatile transport system from ABB’s newly formed Robotics & Discrete Automation business. The presentation was acknowledged with high interest from the German Chancellor and PM of Sweden. 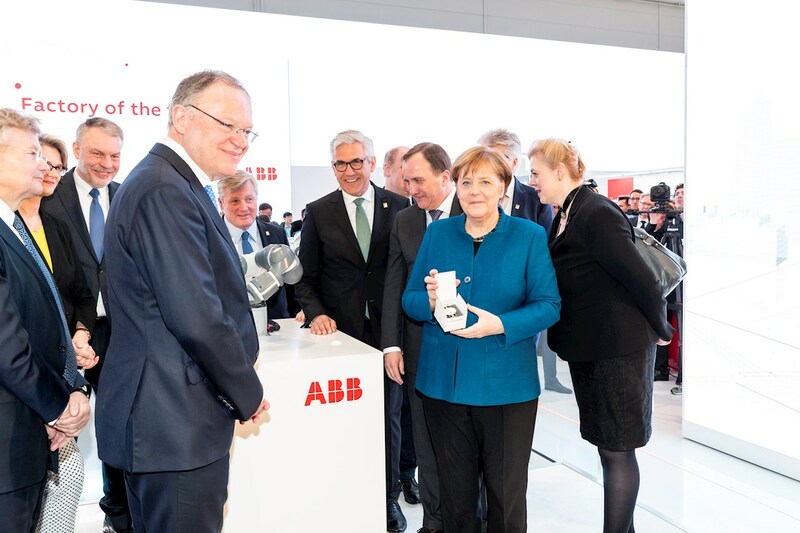 Sweden, as the official Hannover Messe 2019 partner country, is the focus of the world’s most important industrial fair and ABB is proud of its Swedish heritage. ABB was established in 1988 from the merger of Sweden’s ASEA and Switzerland’s BBC. ABB is showing how increasingly smart digital technologies are coming together to transform the way we power, produce, work, live and move at this year’s Hannover Messe. ABB (ABBN: SIX Swiss Ex) has a history of innovation spanning more than 130 years, a pioneering technology leader with a comprehensive offering for digital industries. The digital industries leader has four customer-focused, globally leading businesses: Electrification, Industrial Automation, Motion, and Robotics & Discrete Automation, supported by its common ABB Ability™ digital platform. In 2020 ABB’s Power Grids business will be divested to Hitachi. ABB has about 147,000 employees and operates in more than 100 countries.